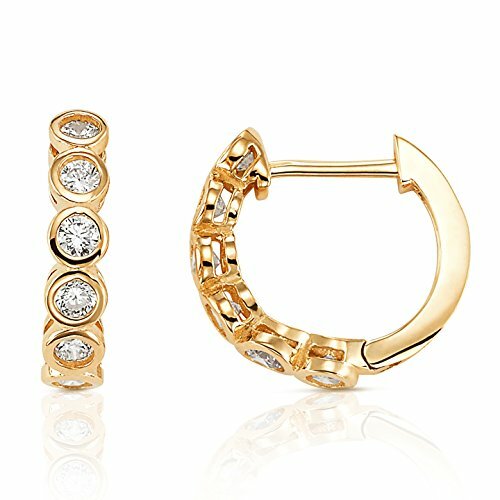 ★GOLD FOR GOOD: Made from 14K yellow gold and cubic zirconia, these elegant huggie hoop earrings are perfectly suited for women and girls. This timeless design will add elegance to any outfit. ★NOT JUST GOLD: While the solid 14k yellow gold is impressive on its own, the cubic zirconia will dazzle all making these pierced earrings perfectly suited for day or evening wear. ★THERE IS NO WAIT: Delivered FAST, these 14K yellow gold and cubic zirconia huggie earrings get to you quickly so you can start wearing them when and where you want.